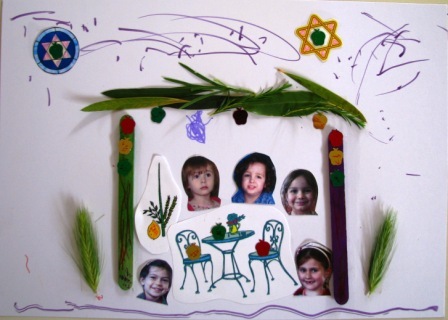 This is an easy Sukkot craft activity for young children. – light card for background, any colour. I used A4 size. – some popsticks, to form the walls of the sukkah. – selection of leaves or small sprigs of greenery, to form the roof of the sukkah. The flatter they are, the easier they stick to the page. I used what was available in my back yard – gum leaves, ferns and lavender. – pictures of a table & chairs (to go inside the sukkah), a lulav and etrog (it’s not Sukkot without them! ), stars (to decorate or go into the sky above the sukkah), and your child (so they can put themselves into the picture). – decorations (pictures, confetti etc) – or draw your own. You could cut picture from magazines, use photos or draw them yourself, but I find it easiest to use Google’s image search to find something suitable, then put all the pictures into one page using Microsoft Publisher and print off as many copies as I needed. For my Shabbat Tot group I printed multiple photos of all of the kids’ faces, so that they could put pictures of their friends into their sukkah if they wanted to. If they are old enough, let them cut the pictures out themselves. – scissors, glue (I find glue sticks are easy for young children to use), crayons/textas/coloured pencils. When sticking on leaves, double sided tape is less mess and probably gives a better result. Give your kid(s) the materials and let them go! Depending on their age and how much parental intervention takes place, you will either get a recognisable sukkah or something that looks like a cyclone went through the back yard, but either way they will have a lot of fun. The picture above (on green background) is my daughter’s finished product from Sukkot last year, made with some assistance from her father. At 3 and a half, she loved sticking things and “colouring” but was not yet able to draw, so it worked out well having the pictures ready for her to assemble, a bit like a freeform jigsaw puzzle. The picture at the top (on white background) was all her own work at 4 and a half. 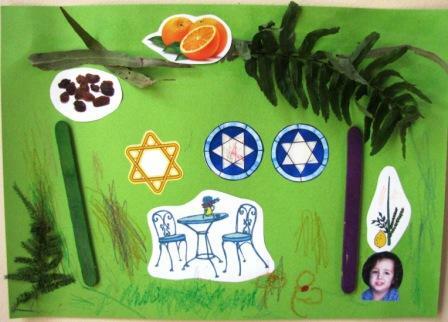 2 Responses to "A child’s Sukkah collage – craft for Sukkot"